For years, I have used Suave products. My favorite Suave products are the deodorants and the lotions. Both of them have great smells and work well. I love that the lotion comes in big bottles with squirt pumps to make putting on lotion after my shower really easy. The deodorant with antiperspirant makes it so that I do not sweat a lot and smells very nice. Another thing that I like about Suave is that it is affordable. It is one of the lowest cost bath and body lines on the market but I think that their products do a good job. They have another product that I used to love as a kid which is the detangling spray. This spray smells really nice and does a great job of getting out the tangles. They also make a mens 2-in-1 shampoo and conditioner, lotion, shower gel, shampoo, conditioner, etc. Suave has a program called the Suave Family Perks program. What you do is scan your receipt when you purchased Suave products and you can earn different perks from Suave. For each Suave product that you buy, you can earn points that you can redeem for a $5 Walmart gift card once you earn 100 points. If you like Suave products, this is a great program to earn free gift cards on things you already buy. 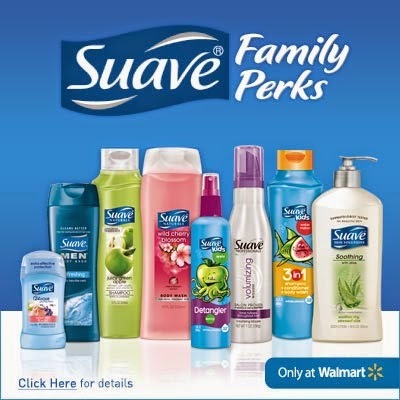 You can enter to win a $50 Walmart gift card through the Suave Family Perks giveaway. Click here to enter! Disclosure: This post is sponsored by Global Influence and Suave. All opinions are my own.